Disclaimer No 2: Don’t go pushing the boundaries by publicly calling everyone you have a problem with a c***. Disclaimer No 3: I suspect that police will not take kindly to being called c***s. Don’t do it. Last week the NSW District Court acquitted Danny Lim of offensive behaviour, for wearing a sandwich board referring to Tony Abbott as a c**t. Mr Lim had previously been convicted in the Magistrates Court and fined $500. Despite a GoFundMe campaign raising the $500 for Mr Lim in a matter of hours, Mr Lim decided to appeal to the District Court, which overturned the conviction. Mr Lim was wearing a sandwich board with the words “PEACE SMILE PEOPLE CAN CHANGE TONY YOU C*N’T. LIAR, HEARTLESS, CRUEL. 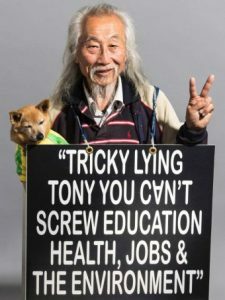 PEACE BE WITH YOU.” The back of the sign read: “TRICKY LYING TONY YOU C*N’T SCREW EDUCATION HEALTH, JOBS & THE ENVIRONMENT CHILDREN’S FUTURE SMILE”. The second letter of the word was an upside down “A” and the word also contained an apostrophe. It was a play on the word “CAN’T”. The Judge also disagreed with the Magistrate’s finding that the language was offensive because it was used when referring to a Prime Minister. He said that politicians are often publicly criticised. “This is an essential and accepted part of any democracy. That criticism can often extend to personal denigration or perhaps even ridicule, but still maintain its essential character as political comment. While the Judge found that the conduct was “inappropriate and in poor taste” he was not satisfied beyond reasonable doubt that it was “offensive, or so offensive as to be considered in the high end of the range of what would be considered to be offensive”. This case shows a clear shift of societal norms in what is, and is not, offensive behaviour. What would have been considered offensive 20 years ago, is not necessarily offensive now. 10 years ago the word was rarely heard on TV or even in movies. These days it is peppered throughout movies and TV shows. Clearly this judge thought that the use of the word, cleverly disguised, was not offensive behaviour. Mr Lim is well known for criticising politicians so was able to argue that the sign was political commentary. This enabled him to raise a defence of “reasonable action”. I think that if the word was unambiguously used on the sandwich board, Mr Lim would probably have been convicted. However, I expect that this decision will now be referred to in other court cases to show society’s increasing tolerance of language that was once highly offensive. Going back to my disclaimers: you and your mates might think it very funny to start hurling out the C-Bomb at the police, telling them that the NSW District Court said it was OK. Want to know who will be laughing when you get locked up overnight? Not you.